Grandma Ingebretson was actually the grandma to my cousins Maryanne, Marlene and Margaret Jean. But I also called her Grandma. I guess because we shared Grandma Marie, I thought we must share her too. We were the California part of the family and the Pedersons and the Johnsons and all the extended relatives liked to be real snowbirds and come to visit us in the winter. We would go to Knott’s Berry Farm ( Disneyland was only a twinkle in Uncle Walt’s eye at the time I was a child ) and visit ghost town and eat fried chicken and berry pie. Another big attraction was the San Juan Capistrano Mission where we would feed the pigeons and tiptoe reverently through the adobe walled chapel and pretend we were not Lutherans. Or The Pike amusement park in Long Beach with its Cyclone Racer and Bumper Cars and House of Mirrors and Cotton Candy. Maryanne had to have a whole ride stopped just for her once (I think it was the Ferris Wheel) because she was determined to get off!!! Who knew she would chicken out then, because I thought she was much more daring then I. When we were little she would clomp up and down the stairs in her mother’s high heels and I could hardly keep up. At a ladies luncheon in Fargo she convinced me to help her pour out all the contents of the purses on the spare bed. And as to Grandma Ingebretson, having been reprimanded for who knows what shenanigans (could be the purses? ), she once shook her finger at her grandmother saying “You doo, doo”- and getting a LOOK, suddenly amended that to (in musical rhyme) – “doo, doo, diddley dum, dum!” That takes guts. But this from the lady who made her husband cut up 30 pounds of alfalfa pellets with scissors! So that was all fun. But the most exotic and exciting side trip we took with the relatives was always the one to Tijuana, south of the border. How I loved it. The sights and sounds were foreign and thrilling. The shops were full of colorful piñatas and Day of the Dead candelabras. The airwaves were ringing with Ranchero melodies. 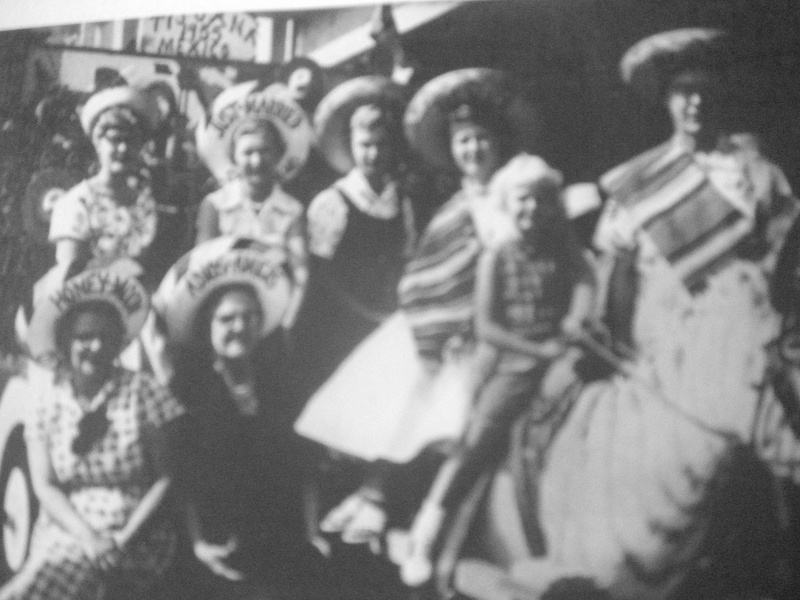 The tourista photo is dark and fuzzy, but it captures the moment when (in the front row, left to right ) Aunt Verna “Honeymoon” and her mother, Grandma Ingebretson “Adios Amigos”, pose with (back row) Maryanne, Mom “Just Married”, Me, Marlene, Margaret Jean on the zebra/donkey, and Uncle Lawrence leading the happy band. Good times were had by all. It is one of the few photos I have of Grandma Ingebretson, but I thought of her today when we got down to the last of the loaves of her Molasses Bread that I recently baked. 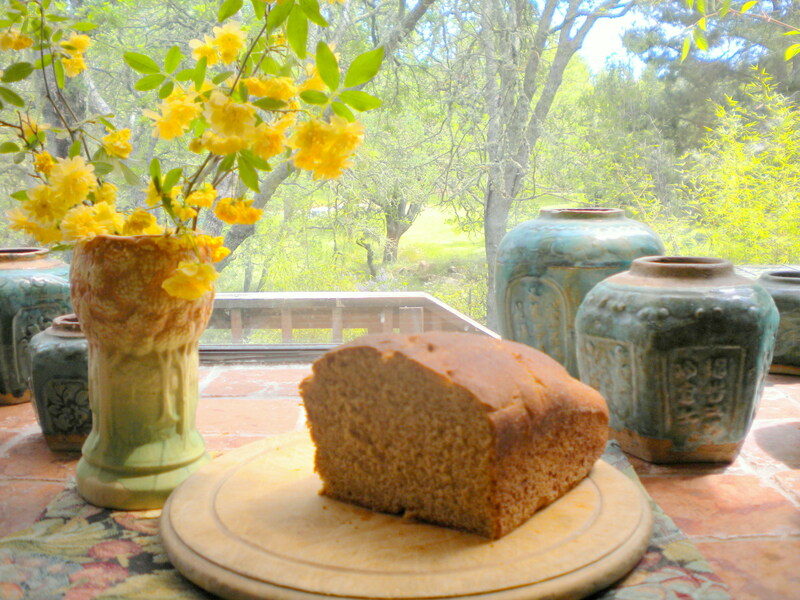 Dense and pungent, bread of the earth, old world taste. Mix together – 2 tsp. Sugar, ½ Cup warm water, and 2 T. yeast. Add and Mix: 3 ½ Cups water, ¾ Cup dry milk, ¼ Cup brown sugar, 51/2 Cups unbleached white flour; ½ Cup Molasses: Beat Hard. Then add: 2 Tbsp. Salt, ¼ Cup shortening, 5 ½ Cups whole wheat flour. Mix into dough, add more flour if necessary. Let rest 15 minutes, then knead until smooth. Let rise in oiled bowl until double. Punch down and let rise again. Put in greased tins and let rise. Bake in 350 oven. Makes 3 or 4 large loafs. And – as the painted plate in my Mom’s kitchen said – “Gid os idag vert daglige brod.” And I may have mis-spelled the quote, but I’m sure I’ll hear from some of the relatives. And I hope so. I really loved this post, it brought back so many good memories we have had together over the years! I had both tears and laughs, missing the ones in pic that are no longer with us, but have given us such good memories, and laughing at all the crazy things that we did when we were together. I especially liked the way you pictured the bread and flowers, just like a magazine page. Keep up the good writing, guess you will not run out of subjects! The pic in Mexico turned out good too!